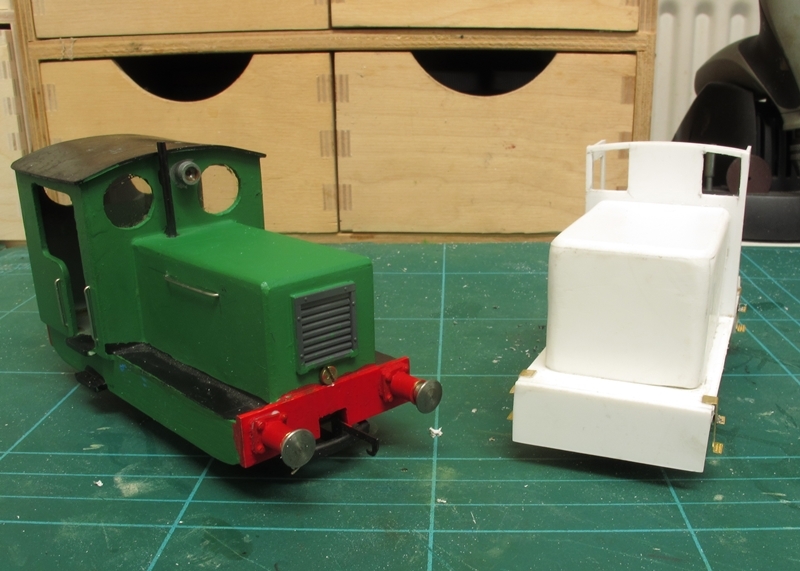 More progress on my 0-16.5mm Narrow Gauge loco construction. Here's the diesel loco (To be named "MERLIN") almost completed and nearly ready for painting.It is shown along side my previously built but recently repainted freelance Hunslett type loco The Hunslett will soon receive the name plates "KATHLEEN" after SWMBO of course! Here we have the same pair of locos from the back end. Merlin requires cab detail and chassis detailing before blowing over with grey primer and a top coat of two tones of green. Finaly for this post, Merlin on the bench with a scratch built 5 ton mineral open wagon. I really enjoy building this stuff, It's just amazing how cheap models like this are to build. This whole project has cost me less than £15 so far and that includes the paint and glue! All the detail fittings are from my odds & ends box. The air horns for instance are made from the unused nozzles of superglue tubes, cut down to size! The hand rails on the inspection side panels are made from staples other odds and ends and home made vacuum pipes complete the job. As well as working on loco building I have also found time to do some work on Penmaenpool MPD. Work this week has seen the size of the "Forest" of trees along the back of the layout increase in size and density. The pictures were taken in my outdoor workshop (Shed!) so please excuse any background clutter, I'm no Photoshop expert so my processing is limited to resize, crop and brightness! Here's another picture of some trees! Note the shed fitter sat outside the mess hut with mug of tea! (The same mug that was featured here a few moths ago and made to 4mm scale! Just to end this post is a picture of the coaling platform now complete with coal, neatly placed fire irons, oil drums and in the foreground some home made weeds with yellow flower heads. Don't ask what they are, a David Bellamy type of bloke I am NOT! No doubt the rivet counters and pedants at it's first show will put me right! I have always had a liking for narrow gauge railways but have never built any sort of layout in any scale. 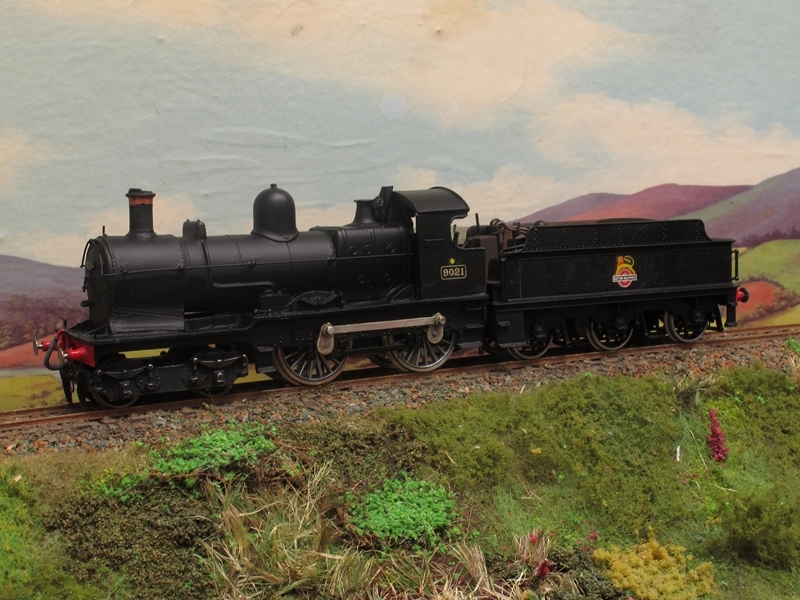 However I have in the past had a quick dabble in building a loco and stock in 0-16.5 Scale. 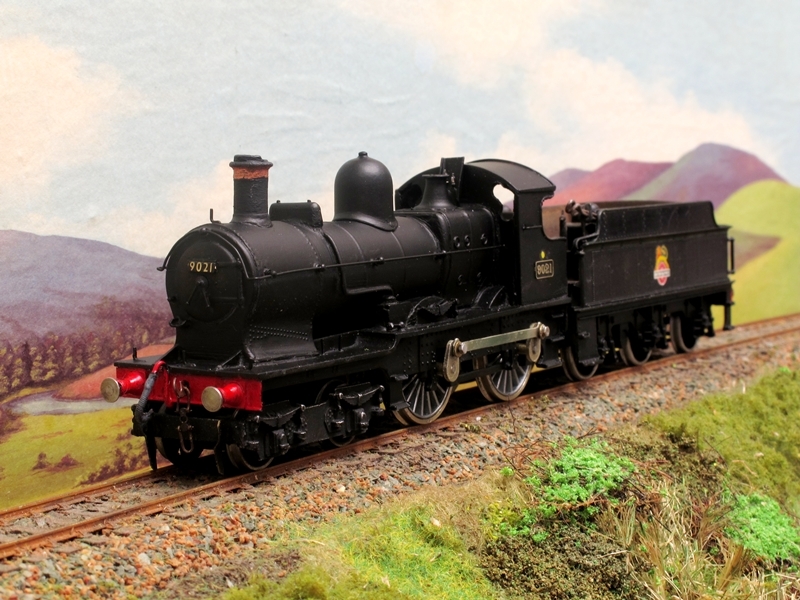 Recently whilst waiting for parts to arrive for the "Two dogs project" the interest has rekindled itself and with a few like minded members of Cradley Heath Model Railway club a 7mm 0-16.5 scale layout may be in the offing. With this in mind a few of us have either built or acquired some 0-16.5 stock. 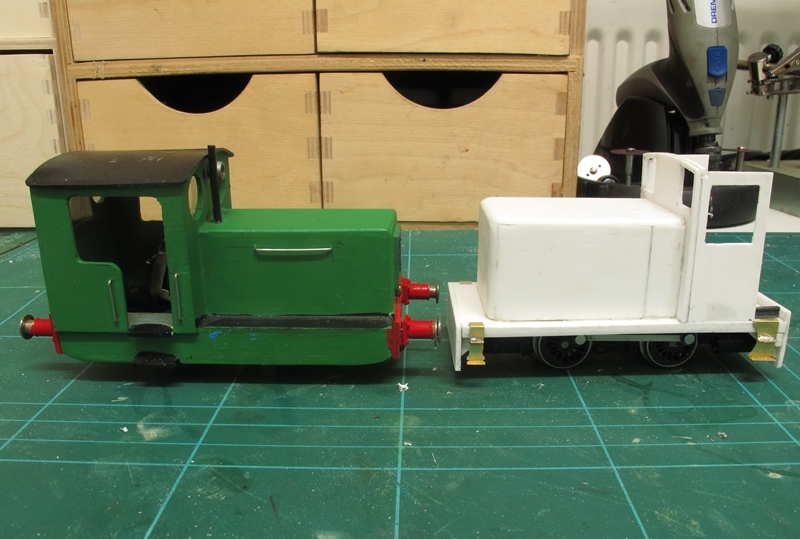 One of our club junior members Stanley Summers (aged 12) is one off the keenest members and has built the green diesel shunter on the left of the photos below. The engine under construction on the right is my attempt at a large narrow gauge locomotive. 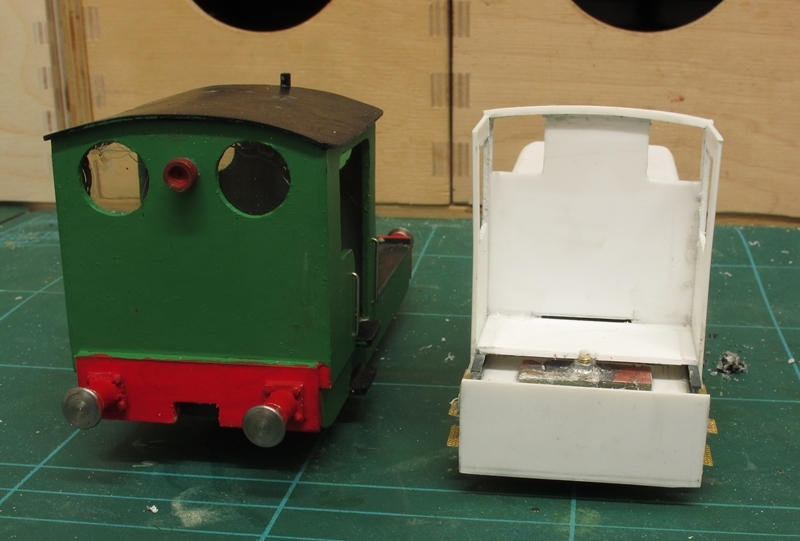 Built out of Plasticard on an Hornby 0-4-0 chassis it is shown for comparison against Stan's excellent effort. My model still under construction still needs the cab to be completed and extra detail to be added to the bonnet and other places. I'll post again on this project when more progress has been made. Another update on the tale of two dogs. I have now reached the painting stage. Transfers (just yellow dots!) and number plates are fixed, buffer heads fitted and front coupling fitted. Seen here posed on my diorama using the "borrowed" power unit with Romford wheels from a clients Bulldog. A few small errors have crept in.The chimney on 9021 should NOT have a copper cap, it was a cast iron job. The R/H buffer needs tweaking, Shed plate is missing, Front bogie needs repainting and the whistles need the black paint scraped off, just to name a few small jobbies.Also the cab detail needs to be scratch built and fitted along with loco/tender fall plate. The list of snagging jobs is endless!